10x AG13 LR44 357 157 303 A76 LR154 L1154 Batteries. Battery type: Takes 1 standard size 18650 3.7V Lithium-Ion battery. 6x Genuine Energizer AG13 LR44 357 157 303 A76 LR154 L1154 Batteries. Capacity: 220mAh. 10x CR2032 Batteries. 10x AG6 LR69 371 LR921 Batteries. 10xAG10 LR1130 L1131 LR54 189 389 390 Batteries. 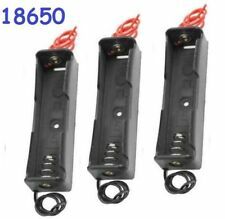 $Features ---Brand new and high quality plastic battery holder for 4 x 18650 Black with 7" Wire Leads --- Battery type: 4 pcs 18650 Case Holder together --- After the series output 14.8V. is installed on the battery, do not touch the red black line. ---With spring clip design, you can easily to put the battery in it. Specifications Color: Black Size: 3.15" x 3" x 0.85" Material: Durable Hard Plastic Output voltage: 14.8V Package includes 4 x 18650 Battery Holder. 2X Series Connected 3V (1.5V x 2) AA Battery Holder Case with 3" Wire Leads. Takes 2 standard size AA batteries, connected in series for 3V (~1.5V x 2) output. 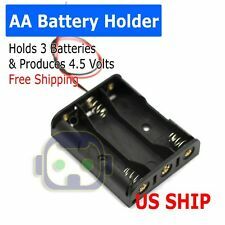 1x Battery Holder Case for 2X AA Batteries (BATTERIES NOT INCLUDED). 10x AG3 LR41 384 392 392A 192 LR736 Batteries. Size: 7.9mm x 3.6mm. 10x LR66 AG4 376 377 LR626 Batteries. Takes 4 standard size AA batteries, connected in series for ~6V (~1.5V x 4) output. 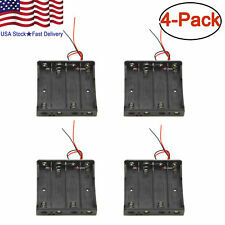 - This AA battery case holds four (4) AA batteries connected in series. - 1X AA Battery Holder. - 2X screw holes for board mounting. Light weight and maintain your battery clean and tidy. Each Box Fits for: 2 x 18650 or 4 x CR123A/16340 batteries (Not Included Here). Waterproof little boxes that can be used to hold anything small you want to protect, keep dust free or dry. This battery box can be placed 12pcs AA size, 14pcs AAA size, 4pcs C size, 4pcs D size, 1pcs 9V battery. 1 x Battery Storage Box. Specially designed in the inner side, prevent the batteries from rolling. This AA battery case holds three (3) AA batteries connected in series. - 1X AA Battery Holder. - Takes 2 standard size AA batteries, connected in series for ~3V (~1.5V x 2) output. - 2X screw holes for board mounting. Save your money - This will keep us from wasting perfectly good batteries by throwing out good ones. DIGITAL BATTERY TESTER - Testing defferent battery types, Battery tester for AA, AAA, C, D, 9V and button Cell Batteries. Capacity: 35mAh. Size: 7.9mm x 3.6mm. CR2 Lithium Battery. These batteries are disposable and lightweight, making them perfect to keep on hand so you're never left unprepared. 3V CR2 lithium battery. 2 x CR2 Lithium Battery. CR17355, CR2, DLCR2, DLCR2B, EL1CR2, ELCR2, KCR2, L1CR2, RLCR2, RLCR2-1. Capacity: 35mAh. 5x CR1220 Batteries. Capacity: 50mAh. 5x CR1616 Batteries. 10x AG7 395 399 LR926 LR927 LR57 D395 Batteries. $Descriptions Made of hard material, durable and environmental, not harmful to humans. Fit for different kinds of batteries, such as AAA, AA. Light weight and Personalized hook design. Can hold 24 AA batteries and 48 AAA batteries, or 48 AA batteries or 96 AAA batteries Individually space design, please storage them base on their classification. Specifications Material: Plastic Color: Clear white Size: 6.89inch x 4.53inch x 1.26inch (LxWxH) Suitable for: Home, office Package includes 1x AA/AAA Battery Plastic Case. 10xAG0 LR63 LR521 379 618 Batteries. 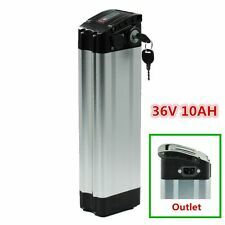 B2G1 Free Battery A23 23A 23AE A23BP MN21 MN23 21/23 GP23 23GA US Seller HOT! Compatible Battery Models: 1811A, 21, 23, 23A, 23GA, 3LR50, A23, E23A, GP23A, GP-23A, GP23AE, K23A, L1028, LR23A, LR-V0, LRV08, LRVO8, MN21, MN-21B, MS21, SES-23A, V23, V23GA, VA23GA, VR22. Type: Miniature Alkaline Battery. Fresh PK Cell quality, alkaline battery. Capacity: 125mAh. 5x CR1632 Batteries. 10x AG1 LR60 164 364 LR621 Batteries. Capacity: 90mAh. 5x CR2016 Batteries. Large battery storage box, you can put AAA AA A 9V batteries together, can be placed 10-20pcs AA, 8-15pcs AAA, 5 pcs C batteries, 4 pcs D batteries, 2 pcs 9V Batteries and etc. (such as battery testers or small flashlights). Capacity: 50mAh. 5x CR1225 Batteries. Capacity: 75mAh. 5x CR1620 Batteries. 100 More Battery organizer storage case.48pcs AA, 24pcs AAA, 8pcs D Cell and 10pcs C Cell, 8pcs 9V battery and 12 batteries button. 8 9v Batteries. 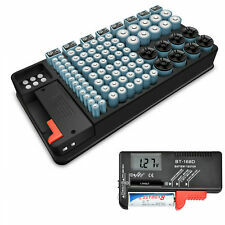 1 x Battery organizer which holds 100 batteries. Works with 8x AA batteries 1.5V. 12 volt battery Holder with on/off power switch. Easy to remove cover. Cover slides and secures in place with screw if needed. 10x AG3 LR41 384 392A 192 LR736 Batteries. 10xAG2 LR59 396 397 LR726 612 196 Batteries. 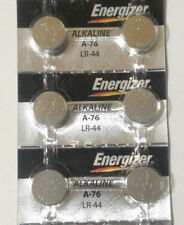 10 Pieces AG 13 LR44 G13 A76 1.5 volt Button Cell Battery Fresh Alkaline. Fresh PK Cell quality, alkaline battery. This battery holder can be make to 12v battery output(1.5v x 8 =12v). 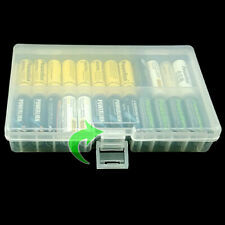 Battery Holder Box for 8pcs AA size batteries. 7.12V 8 x AA Battery Holder Box. Battery type: 8pc AA battery. Type:Battery Storage Box. Battery Holder Case for 2X Series-Connected 18650 8V Lithium-Ion Batteries (2S) with 6" Wire Leads for Soldering / Connecting. Takes 2 standard size (18mm x 65mm) 18650 3.7V - 4.2V batteries, connected in series for ~8V (~4V x 2) output. 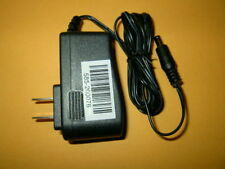 Battery type: 18650 Lithium-Ion button-top battery. Takes 1 standard size 18650 button-top battery. Protected cells longer than ~67mm may not fit this holder. 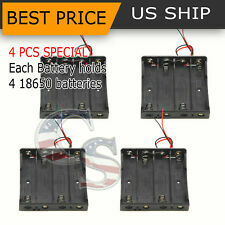 5x (5 Pieces) Battery Holder Case for 1X 18650 Battery (BATTERY NOT INCLUDED). Part Number: BH383B. Manufacturer: VELLEMAN. Capacity: 150mAh. 5x CR2025 Batteries. 100x LR66 AG4 376 377 LR626 Batteries. 2 PACK Battery A23 23A 21/23 MN21 23AE Car Remote FOB Control Doorbell US HOT! 1811A, 21, 23, 23A, 23GA, 3LR50, A23, E23A, GP23A, GP-23A, GP23AE, K23A, L1028, LR23A, LR-V0, LRV08, LRVO8, MN21, MN-21B, MS21, SES-23A, V23, V23GA, VA23GA, VR22. Miniature Alkaline Battery. Use this battery to keep a variety of devices powered. This AA battery case holds two (2) AA batteries connected in series. - 1X AA Battery Holder (Holds 6 AA batteries). - Takes 2 standard size AA batteries, connected in series for ~3V (~1.5V x 2) output. Premium Quality, Free 6 Stickers Label, Fast Ship! Size: 12.6 7.1 2cm. 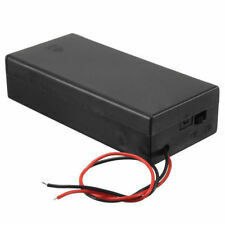 1pcs Wire Leads Plastic Battery Storage Case with rear cover and switch for 8AA(12V). Battery model: AA. Reference: 16030066001. Connect type: Wire leads. Battery number: 8. Used as a perfect external power source.